As y’all know, I really like to sample different blends and breeds in my spinning. The variety keeps me fresh and inspired and challenged so I try to get my hands on a bit of everything and to switch things up a lot. 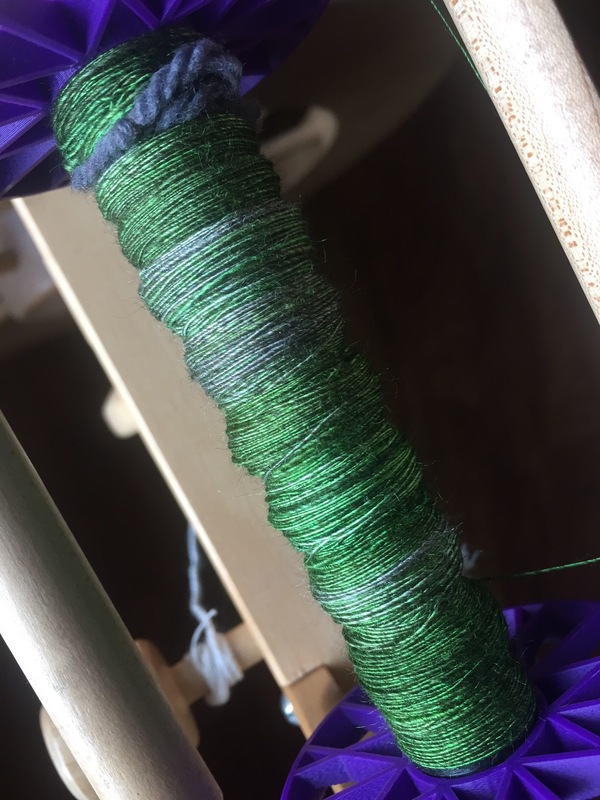 Last fall, I’d been reading a lot about yak + silk blends and hearing good things from spinning friends, but I wasn’t quite ready to go there. Yak can be pricey and I was really conscious of that fact. 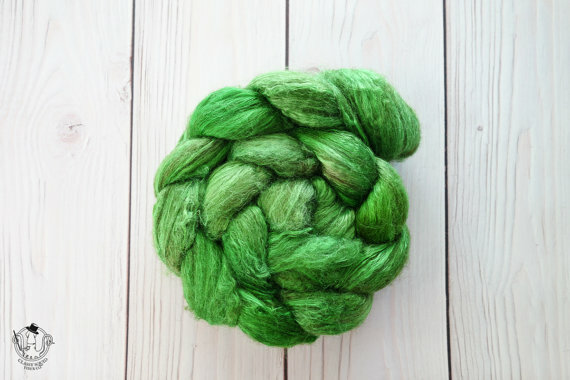 Sometimes I can use the novelty of a fiber as an excuse to spend the extra cash to try it out, but with yak I was just holding back because it was a big investment for a fiber I wasn’t 100% sure I’d like spinning. Photo courtesy of Classy Squid Fiber Co.
At just 2oz, it was a pretty safe, inexpensive trial run. Or so I thought. And it was really a wow. The green was such a vibrant hue, especially at the end of December that I was totally smitten. The fiber base itself was also a huge wow. The yak is naturally brown, so when paired with the silk it creates this incredible mix of effervescence and earthiness. It wanted to spin super light in my hands and I wasn’t going to argue. 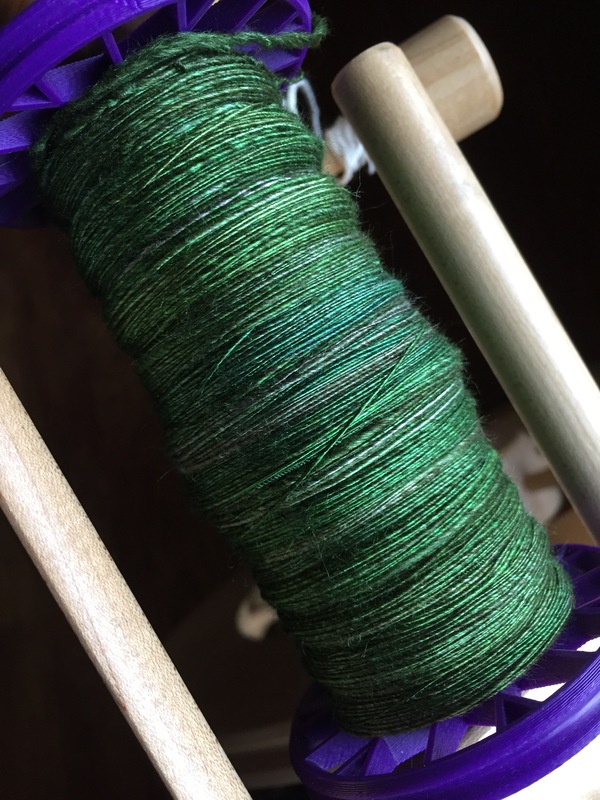 By the time I was halfway through my 2oz, I knew that 1) that it was not going to work plied with the fiber I’d purchased it to ply with and 2) that I was going to need more because 2oz was just not going to cut it. I contacted Amanda, the talented lady behind Classy Squid Fiber Co, and asked if it would be possible to special order another 2oz. Since this braid had been listed as limited edition, I knew her response could go either way. She got back to me promptly and let me know that she could indeed do a special order, but that she’d be dyeing from memory as this was a one of a kind and would I be OK with that? My intention was to get another 2oz and then ply the two together so I knew they didn’t have to be exact. I went with it. When the special order was ready to go, Amanda had gone ahead and dyed 2-2oz braids instead of one and I gladly snapped both up. Sometime shortly after our move, I managed to finish up the 6oz of super fine singles. I found the plying a little challenging. 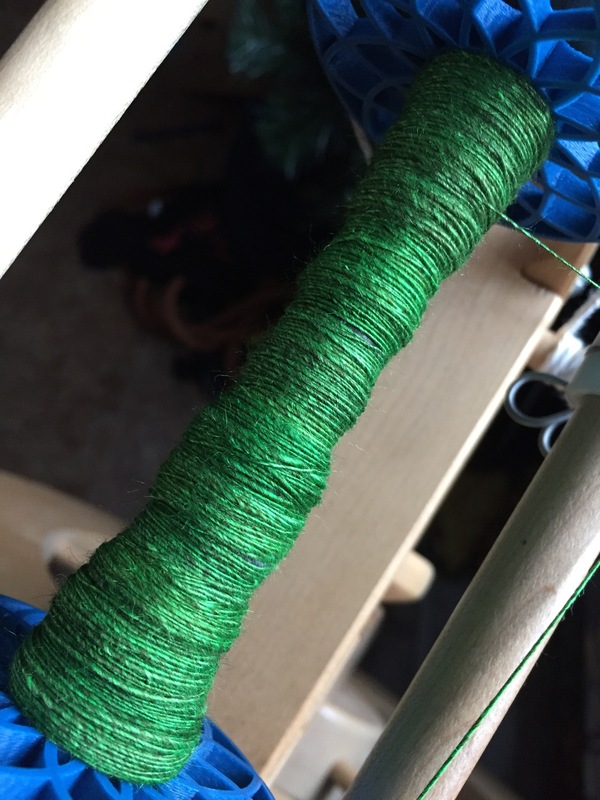 I could not for the life of me get a feel for how much twist felt right in the plied yarn. I was a little under-twisted I think early on. And then there was a section where I was kind of over-twisted. By the end I think I had it, but it was certainly a roller coaster of not knowing — the fiber was new to me, the spinning chair was still brand new, and the position I was plying in was different, too. I did my best and stayed hopeful that it would all even out in the finishing. Oh, and it really did. This photo shows the greens a little better, but the camera just cannot capture exactly how energetic this green is. 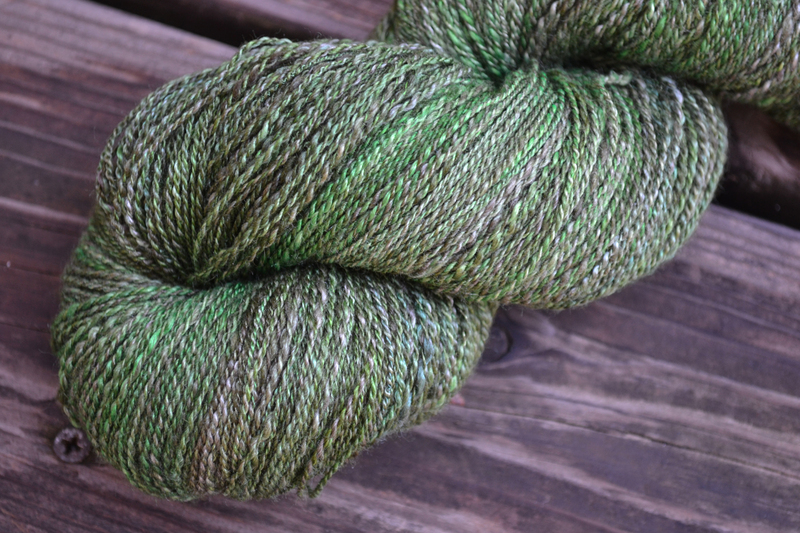 The skein itself is 6.1oz and about 20wraps per inch landing it squarely in the lace weight category. The best part though? 650yards! I’m slightly shy on official yardage, but based on the other project notes on Ravelry I think I should be just fine making what I think will be fabulous, an Everly Shawl. So it goes that a harmless little 2oz braid of fiber, purchased out of sheer curiosity & because it happened to be just a taste of the fiber base turned into a 6oz, 650yard luxury of luxuries. And now it’s a pretty little skein destined to be a fantastic shawl. So goes the life of a spinner and the wheel keeps on spinning toward the next inspiration, challenge, and curiosity. Another spinning post or two from you and I’ll be buying a wheel and taking classes. You wouldn’t be the first and hopefully wouldn’t be the last! Do it! Great green!! i love it!! Oh wow – that green! 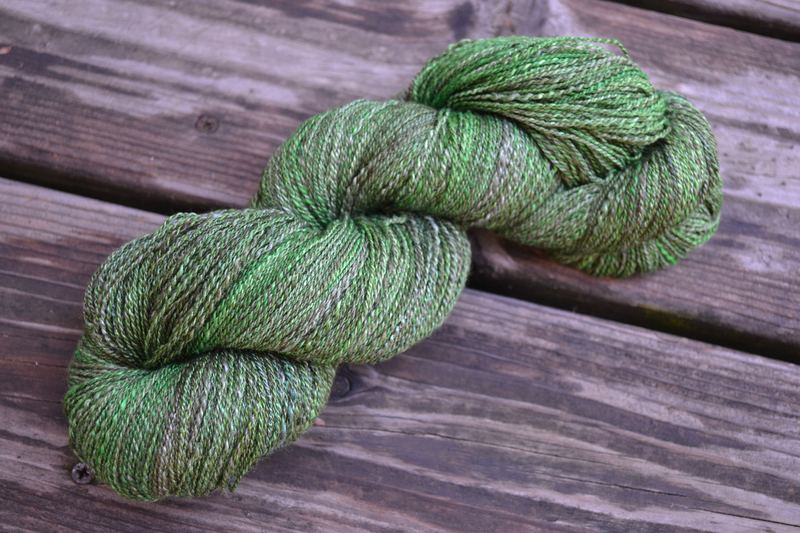 And your final skein looks great too; it’ll make a great Everly! I think so, too! I really wish I could pick up the green better with the camera, but you’ll have to take my word for it that it’s a thousand times better in person! 😁 The yak has a very short staple length, so depending your blend keep that in mind. It comes pretty easily though and I would wager it’s easier than the beads! I can’t recall the blend off the top of my head, but it is likely merino, also short. Purple Fleece used it as the fiber of the month this winter sometime -a nd used a photo of mine for inspiration, so it is named Salpal. 🙂 I can’t make a hash of that one!